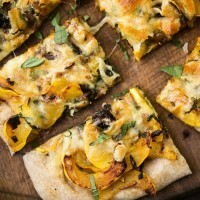 Delicata Squash Pizza | Naturally.Delicata Squash Pizza | Naturally. 2 tablespoons shredded basil, plus extra for topping. Cut the squash and onions into thin slices, about 1/8″ thick. Heat a large skillet over medium-low heat and add 1 tablespoon olive oil. Add in the squash and onion slices, stirring occasionally. Let cook until mixture starts to brown, 8 to 10 minutes. Add in garlic, cook for one more minute. Remove from heat and stir in the basil. Preheat oven to 450˚. Roll the pizza dough out in a rectangle that is roughly 8” by 12”. Transfer to a sheet tray. Brush the crust with olive oil then sprinkle the delicata squash mixture evenly over the dough. Sprinkle with 3 ounces of shredded cheese and add more as desired. Bake for 12 to 15 minutes until crust has browned and cheese has melted. Sprinkle with extra basil and serve.